Born and raised in Michigan, it’s hard for me to imagine what it would be like to have never experienced snow, but today we had the privilege of being with someone seeing snow for the first time. It’s not often I’ve prayed for snow, except perhaps as a child hoping for a day off school, but I did pray that we would have snow for Naftaly. 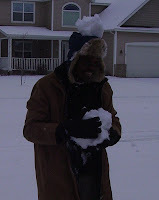 He is here from Kenya for just a couple days, and I knew that snow was something he wanted to experience firsthand. When we stepped outside and saw everything covered in a fresh blanket of snow, he didn’t comment on the cold as much as the beauty. Even the trees that “looked dead” without their leaves now looked beautiful. Really, what can you think of that is whiter than snow? Personally, I can’t think of anything. Imagine seeing a blanket of snow that is whiter than anything you’ve ever seen before. This is how pure we are when God has forgiven our sins. Thank you, Naftaly, for reminding us of this truth!